SkinCeuticals’ product philosophy and consumer education programs are built around the principles of Prevention, Protection, and Correction. These three steps address and minimize the effects that environmental aggressors have on the skin and the use of topical antioxidants play an important part in this. Free radicals are molecules with unpaired electrons, causing them to be unstable and highly chemically reactive. These unstable molecules are generated by UV rays, infrared radiation, pollution, and lifestyle factors like alcohol and cigarette smoke. Inside the skin, free radicals damage cells, their DNA, and other vital cellular components. Over time, free radical damage leads to visible signs of accelerated skin aging, including fine lines, wrinkles, laxity, discoloration, and even skin cancer. A topical vitamin C antioxidant must penetrate skin to be effective. This is dependent on three factors: The form of vitamin C used, the concentration, and the pH of the solution. In the years since the patent, each subsequent antioxidant generation has been subjected to rigorous clinical studies—and the results are clear: SkinCeuticals topical antioxidants neutralize free radicals caused by solar radiation and other environmental factors for inside protection, while synthesizing collagen production for outside correction. In order to maintain and improve the health and appearance of skin, a proper skincare regimen is essential. Although the specific products depend on skin type and skin conditions, every effective regimen must include three fundamental elements — Prevention, Protection, and Correction. To “Prevent” accelerated skin aging and skin cancer, it’s imperative to use a daily topical antioxidant. This targeted range of products prevents skin damage by neutralizing the free radicals generated by UV rays, infrared radiation, and other environmental factors like pollution, alcohol consumption, and cigarette smoke. Photo damage created by the sun is the number-one cause of accelerated skin aging and skin cancer. In order to prevent this damage, it’s essential to “Protect” skin with sunscreen. SkinCeuticals offers a full range of broad spectrum sunscreens designed for different skin types, conditions, and lifestyles in order to shield skin from UV rays. To minimize lines, wrinkles, discoloration, and other visible effects of past damage, SkinCeuticals offers products designed to “Correct”. These potent skincare products are formulated with powerful ingredients and advanced technologies to restore a healthier, younger-looking complexion. SkinCeuticals corrective products combine anti-aging, lightening, and exfoliating ingredients to help rehabilitate the skin, restoring a healthier and more youthful appearance. Our active ingredients and advanced technologies correct fine lines, wrinkles, discolorations, acne, and more. Whether you’re concerned about wrinkles, hyperpigmentation, acne, redness or all of the above, SkinCeuticals corrective products are formulated to exfoliate, repair, and rejuvenate the skin. Our range of creams, serums, masques, and targeted treatments for the delicate eye and lip areas have been clinically tested and shown to work synergistically with the rest of your SkinCeuticals regimen to provide optimal results. The skin is the body’s largest organ, and it serves as a protective barrier. Its health and surface appearance are determined by environmental factors as well as the function of the components that comprise the layers below. Normal skin is hydrated, tends to be clear and even-toned. Normal skin tolerates exfoliation and more aggressive skincare ingredients. Oily skin is caused by overactive oil glands. A shiny appearance, enlarged pores, and acne are primary concerns. Dry skin experiences flaking, itching, and dullness. Dry skin does not produce enough oil. Cold weather and harsh conditions make symptoms worse. Combination skin is dry in some areas and oily in others. Oily skin is often seen in the T-zone (forehead, nose, and chin). Sensitive skin reacts to products or environment with redness and itching. Sensitive skin is often experienced from birth. 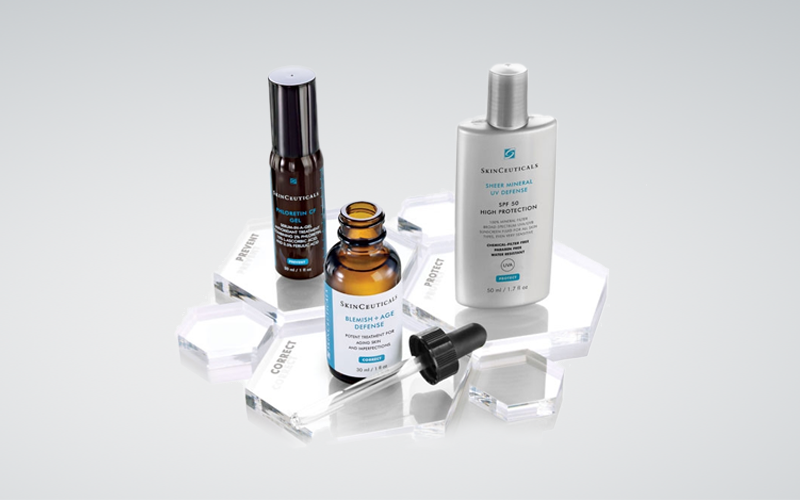 The SkinCeuticals formulas are designed to improve skin health and repair damage that causes specific skin conditions and visible signs of aging such as fine lines, wrinkles, laxity, and hyperpigmentation. These products offer a bridge between prescription-based products and over-the-counter cosmetics – and they are backed by medically accepted science that proves their efficacy. Dry skin and wrinkles are caused by sun exposure and decreased oil production. Signs include enlarged pores, loss of elasticity, wrinkles, and uneven skin tone. Excess oil and excessive cell production lead to breakouts. Acne includes blackheads, whiteheads, cysts, and nodules. Excess pigment production leads to spots and uneven skin tone. Sun exposure is the primary cause of pigment changes. Hormone-induced hyperpigmentation causes dark patches on the forehead and cheeks. Past acne and other trauma may result in dark spots. Rosacea causes persistent blushing and flushing. Rosacea may lead to broken blood vessels and pimple-like lesions on the cheeks and nose. Dehydrated skin is rough, itchy, and flaky. Dehydrated skin does not maintain proper levels of hydration. Lack of moisture makes wrinkles more visible. What in-office SkinCeuticals Professional procedures are offered? SkinCeuticals offers a range of clinical-grade professional peels and facial treatments performed by SkinCeuticals skincare professionals in doctors’ offices and medical spas. When these targeted skincare solutions are combined with a customized SkinCeuticals at-home regimen, the result is healthier skin with visible improvement in signs of accelerated skin aging and other skin conditions. SkinCeuticals is sold in 25 countries around the world through dermatologists, plastic surgeons, medical spas, select pharmacies, and premium spas.